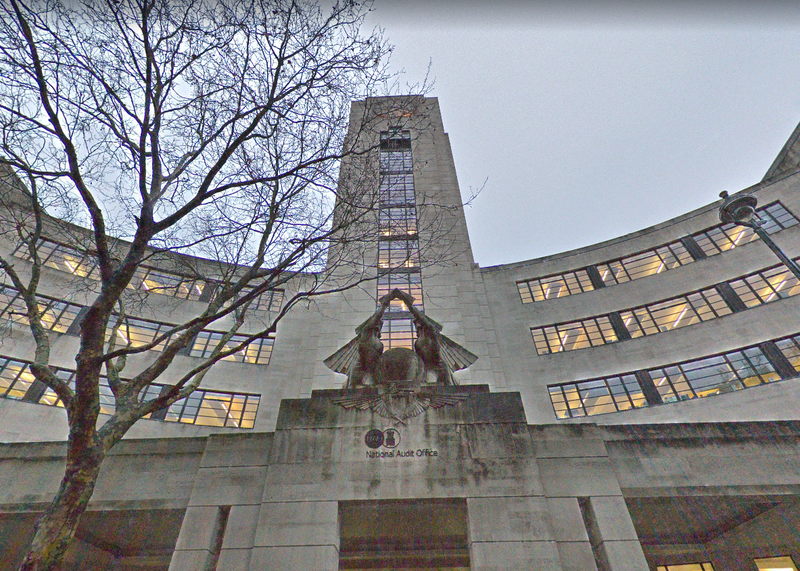 The National Audit Office (NAO) has called on the government to increase transparency to improve the delivery of government’s biggest and riskiest projects. In its report on the projects leaving the Infrastructure and Projects Authority (IPA) portfolio, the NAO says that poor records and reporting are making it difficult to assess whether major government projects are delivering on their objectives. The report says that “the limitations in data and record-keeping reduce transparency, particularly for the early years of the Portfolio”. It adds, “thirty-four projects left in 2011-12 without a delivery confidence assessment being recorded”. The NAO says that, to improve transparency, the IPA and the Treasury should require all major projects to have a business case that is kept up to date as the project changes. The IPA’s report examines projects leaving the Government Major Projects Portfolio (GMPP), which comprises the biggest and riskiest projects across government. The GMPP includes 29 ICT projects, with £10bn budget whole-life costs, that aim to modernise technology to reduce cost and provide better access to services. The IPA expects these projects to bring to government departments £24bn budget monetised benefits. 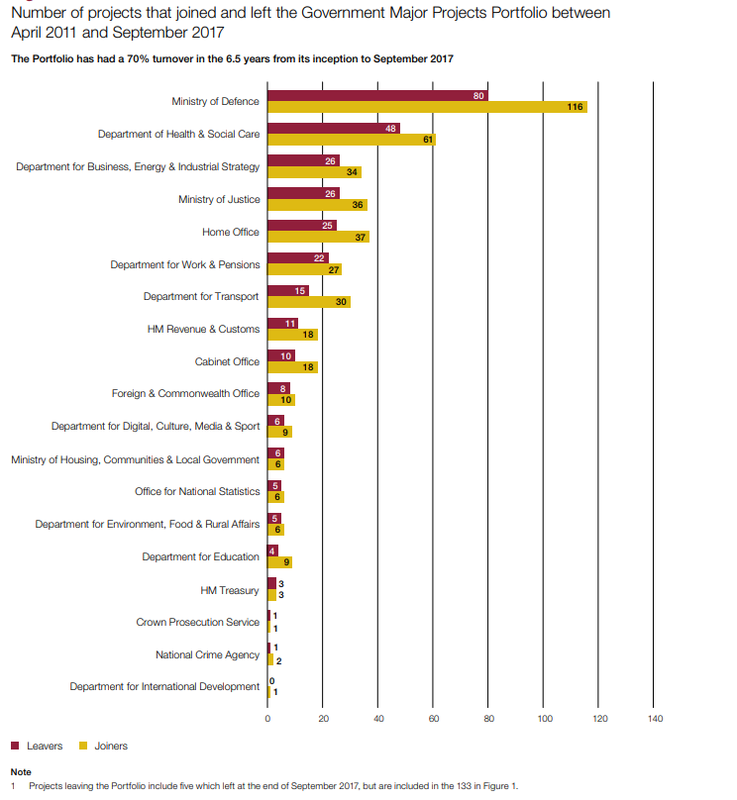 The NAO said that for the 302 projects that have left the Portfolio since its inception in 2011, the Authority does not have complete data on the reasons why they had left and what they had delivered by the time of their departure. however, what has been delivered, the NAO said. This is in part because it may take years for a project to deliver its strategic outcomes. As delivery outcomes are not reported after projects have left the Portfolio, the NAO followed up on a selection of 48 projects from across 17 departments to examine what happened to them and whether they delivered the intended benefits. 35 of these had reached a significant delivery milestone when they left including IT projects that were being rolled out and initiatives where the department funded activity for a period of time, which was complete, as well as projects where construction was complete. 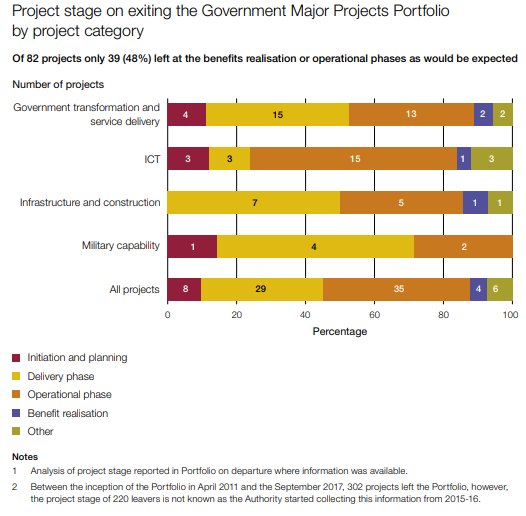 Thirteen of the 48 projects in the report selection left for reasons other than delivery. In five cases, the project left because the authority and departments “considered that it had made sufficient progress and no longer needed to report to it, or because a project’s scope had reduced”. Four programmes were cancelled either because of “not being likely to achieve their objectives, or the availability of a more cost-effective alternative, or government policy changed, or a combination of these reasons”. There were also four projects that left as they were merged or disaggregated into different projects. For example, the Department for Work & Pensions (DWP)’s IT programme was separated into two smaller projects that subsequently joined the portfolio. Overall the NAO report finds that most projects had delivered the intended outputs, “even if longer-term success is not clear”. The NAO assessed that, of its selection of 48 projects, in 12 cases the project had produced the intended outputs. “For example, the Super-Connected Cities Initiative was a £150m fund to improve internet connectivity, help with small businesses’ broadband costs, Wi-Fi in public buildings and other capital projects. It initially covered 22 cities. The scope was widened to 50 cities and the initiative spent £121m to 2015-16 when it left the Portfolio. It had clear metrics for measuring success. An impact review concluded that the project had delivered more than intended”, the report said. The Public Accounts Committee (PAC) had previously recommended that the authority should “push departments to state project benefits clearly and to establish appropriate data systems to measure them; should certify that benefits were on target to be achieved before a project left the Portfolio; and needed to make it clear to departments that once a project left, the department was responsible for realising the agreed benefits”.